This assignment aims to create a professional film stander storyboard for a PSA. Created in 705-storyboard course at Savannah College of Art and Design. Action/Plot : Something in the grassland. 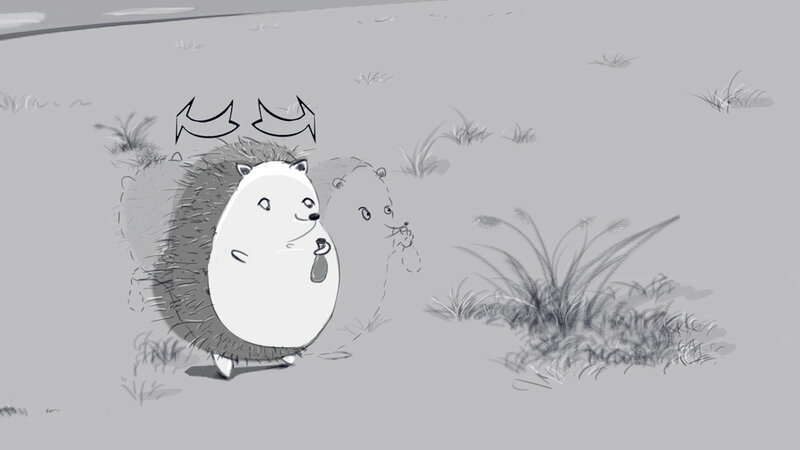 Action/Plot : A hedgehog is walking on street. From left to right. Camera/Transition : Full Shot. Cut. Camera/Transition : Medium Shot. Reaction Shot. Cut. Action/Plot : A flat balloon lies on street. Screen right. Camera/Transition : Medium Shot. Cut. Action/Plot : He is walking quickly towards to the air balloon. Camera/Transition : Medium Shot. Over shoulder. Handheld. Cut. Action/Plot : He is picking up the balloon. Camera/Transition : Full Shot. High-hat. Cut. Action/Plot : He is looking around, in order to find out whose stuff. Camera/Transition : Medium-close Shot. Cut. Action/Plot : He is putting balloon into his mouth. Camera/Transition : Close-up Shot. Zoom in. Audio : Ambiance. Putting balloon into his mouth. Action/Plot : He feels something wrong. Camera/Transition : Close Shot. Cut. Audio : Ambiance. Stomach sound. Action/Plot : He is inhaling (breathing deeply). Audio : Ambiance. Inhaling sound. Action/Plot : He becomes more and more round. He looks like a puffer fish. Camera/Transition : Full Shot. Zoom Out. Audio : Ambiance. Hedgehog wants to scream. Action/Plot : He is going up until out of screen (Flying away). Camera/Transition : Long Shot. Zoom Out. Action/Plot : Sky with clouds and sun. Then he shows up, from left to right. Camera/Transition : Long Shot. Cut. Audio : Ambiance. Hedgehog wants to scream, shaking hands and legs. Action/Plot : He is in sky. His shadow shows on the grassland. Toward to river direction. Camera/Transition : Bird’s eye view of the grassland. Cut. Camera/Transition : Tracking Shot. Zoom in. Camera/Transition : Full Shot. Zoom in. Audio : Ambiance. Baby pufferfish “gulu---gulu---”, Babbles. Action/Plot : A light bulb is falling down into water. Puffer fishes go away. Audio : Ambiance. Light bulb falls into water. Babbles. Action/Plot : The light bulb in the front of octopus. Camera/Transition : Extreme Close-up Shot. Cut. Action/Plot : Octopus grasps it and tries to put it in mouth quickly. Audio : Ambiance. Octopus eats light bulb. Action/Plot : She is glowing. Camera/Transition : Medium Shot. Zoom out. Audio : Ambiance. Electric leakage. Action/Plot : She is still swimming forward. Sometimes with electric leakage. Action/Plot : She is swimming out of screen. Action/Plot : Two raccoons are laughing at something on grassland. Camera/Transition : Full Shot. Pan left. Audio : Ambiance. Two raccoons are laughing. Action/Plot : A raccoon becomes a bottle shape. Camera/Transition : Full Shot. Pan right. Action/Plot : One of the two laughing raccoons is still laughing. Another one is missing. Audio : Ambiance. A raccoons is laughing. Action/Plot : The right one becomes a milk box shape. Audio : The hedgehog is still flying.